The Belwood of Los Gatos, Belgatos, Surmont, and contiguous neighborhoods in east Los Gatos saw strong appreciation in 2017. With a low amount of available real estate inventory and high buyer demand, properties listed under $2 million often saw multiple offers and good overbids. Over $2 million, the market was cooler, but still not too challenging to sell if done right. Early 2017 was a bit sluggish, with homes taking longer to sell and recording under list price through February. These homes were priced on the higher end for homes in the area, and they were selling during the typically cooler winter months, both of which might have contributed to the slower turnover. By March the market was heating up again with the large majority selling above list price (likely multiple offers) in under a month through to the end of the year. The three that took longest to sell (from March through November) also sold below list price. Most challenging to sell are the luxury tier properties offered at $3 million or more. In 2017, the house with the longest days on market was in this category. This is normal for the luxury market in east Los Gatos. In summary, through most of the year there was high demand and quick turnover for homes in the Belwood area in moderate price points. These fast moving homes provide approximately 3-5 bedrooms and list in the price range of %1.5 to $2 million. The last couple of months in 2017, prices began shooting up with the news of Google’s expansion into downtown San Jose. The ripples were felt through Willow Glen, Cambrian, and into Los Gatos. What sold for $1,750,000 in the middle of 2017 is likely to sell for significantly more in 2018. 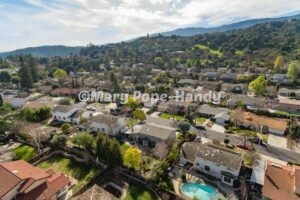 If you’re interested in buying or selling a home in this beautiful corner of Los Gatos, please reach out to me and we can have a confidential and no-obligation conversation / consultation.